I have seen a card over on Pinterest that had a theme along the lines of this card. I loved the idea of it and wanted to make something along the same lines. It a simple and straight forward card, however it uses many of your crafty bits and bobs. Double sided tape runner - S56986. 6mm Ultra strong red liner tape - S57090. 2mm 3D foam pads - S57082. Christmas traditional 12x12 paper pad - Trimcrafts. 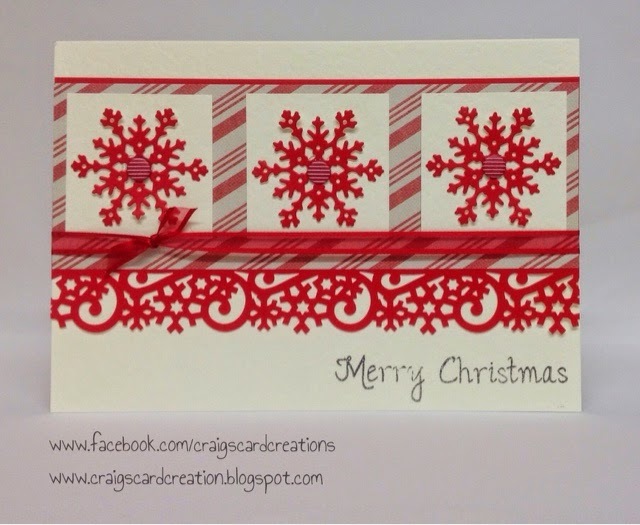 "Tis the Season" clear stamps - Trimcrafts. Red Adorable Scorable - Hunkydory Crafts. Snowflake die - Tattered Lace. Snowflake swirl punch around the page - Martha Stewart. 10mm red organza ribbon with satin edged - American Crafts. Tuxedo black ink pad - Momento.